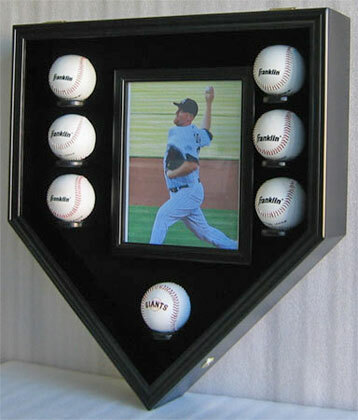 Item shown above : Solid Hardwood - BLACK FINISH with a semi-gloss protective lacquer coat (baseballs and photo not included). MLB baseball and 8 x 10 photo shadowbox display case. Made from hand select solid wood, this display case comes with a photo frame for showcase a photo or your favorite player. The ball holders are affixed to the display case and has indentation on each one to secure the ball from rolling. The doors are hinged with brass hinges. It comes with a lock and 2 keys. The surface is extra fine and smooth. The interior background of the display case is felt with fine fabric. Wall brackets already available on the back of the display case for wall mounting.